We can agree that a hybrid table saw has always been one of the most useful tools in woodworking. This is mostly because a hybrid table saw is a perfect combination of a cabinet saw and a contractor saw. Therefore, it’s safe to say that a hybrid table saw is best of both worlds. Also, buying a hybrid table saw makes woodworking much easier. Well, a contractor-style saw has many benefits, but so does a cabinet saw. When you combine the two, you get both tools in one, a hybrid table saw. 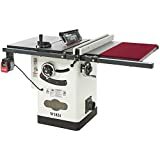 What’s the best hybrid table saw of 2019? What to look for? How to use a hybrid saw? Read about all that, and much more, as we review each best hybrid saw. When looking at the best hybrid table saws, you should pay attention to certain details and features. It’s important to look at the full face of the hybrid saw, the difference between a contractor-style and a cabinet saw. Of course, there are many models on the market, so it’s only normal you wonder which table saw would be the best for you. Luckily, to make your woodworking easier, we bring you the list of the top 5 hybrid table saws of 2019. You can already see the difference between a hybrid table saw and a contractor saw or a cabinet saw. Naturally, the hybrid table saws are just as powerful and able to handle majority of woodworking. Also, they operate mostly in standard power outputs, but check on that before purchasing. Its amperage is quite impressive, as well as the arbor size, which are essentially some of the most important factors. Apart from a comparison table, a hybrid table saw review also tells a lot about the tool itself. If you want to learn more, read about these 5 best hybrid table saws. If you’ve been in woodworking for a while, you probably heard about this hybrid table saw. Like most, this hybrid model has the benefits of both contractor saw and cabinet saw. More precisely, its size and ease of transportation comes from a contractor saw, while its features, and dust control come from a cabinet saw. Like many other Grizzly table saws, this hybrid model features a quick-change blade guard, to increase safety of use. More so, it also features the anti-kickback pawls that you can position away from your work piece. However, this hybrid saw features a riving knife that offers protection during those operations that require the removal of the blade guard. Also, its fence system is easy-glide and it features a CamlocAk fence for excellent accuracy. A serpentine belt is also included for silent operation and power transfer. Finally, we’re talking about a powerful hybrid saw, with a 2HP motor of 16A at 110V and 8A at 220V. Even though customers don’t seem to have any complaints on the hybrid saw itself, they do have some for the packaging and delivery. Apparently, people have received broken parts, or the boxes never arrived. Of course, it depends where you buy and who you buy from, but essentially, this is a problem. If you receive a broken part, you should contact the manufacturer’s customer support. Finally, they’ll gladly help you to fix whatever problem you may have with the hybrid table saw. If you require a lot of space while working, this is the right hybrid table saw for you. The table features 52 inches of RH Rip, which means all work is delivered to the blade accurately. What’s most important is the stability of this woodworking tool. Its tubular stand offers maximum stability and all support you need. Simply, not only it’s stable but this hybrid model is also one of the most precise ones on the market. That’s thanks to the one piece rail system that provides maximum precision at all times. Also, this hybrid table saw is safe to use because it features blade brake, which is what stops the blade in a second you turn the power off. Essentially, this is a large hybrid tool, as reviewed. Its induction motor is 15 Amp, 1 PH, and 60 Hz. Also, the hybrid saw features a dual 120V-220V voltage. Most people criticized that there aren’t any intuitive instructions for assembly. Of course, when it comes to these heavy duty, hybrid tools, it’s important that you have clear instructions on how to assembly them. If now, you can be in a problem and especially if this is your first hybrid table saw. Also, some people claim that the parts they received didn’t mesh together very well. Naturally, this is a major issue, and you should contact Delta if this is the case. At the end of the day, they’re the best people to help you with the issue and they even have a FAQ’s feature on their website. Other than that, the hybrid saw seems to work fine. This hybrid table saw is one of the best models on the market today. It weighs more than others, but you’ll find all the stability and strength you could possibly need. Its cabinet is durable and strong, so you’re able to work with any heavy and hard wood. The front as well as the sides feature metal hand wheels, which make it easy to move the wood. Not only it’s easy to move wood along the blade, but the blade features a quick release, so it’s easy to pop out. This hybrid tool is popular mostly because it’s powerful, but large enough to support any large pieces. In addition, it features an extension table that provides enough space for those big projects. Essentially, you have more control of wood. Also, there’s a 4Inch dust port that makes the overall experience even better and more convenient. Finally, the motor of this hybrid saw is 2HP, with voltage of 110V-220V. There aren’t many complaints on how this hybrid tool works. However, some people did point out that they found it complicated to use. At most times, this depends on how experienced you are. Thought, everyone’s looking for machines as easy to use as possible. Finally, read about its features as reviewed, so you can decide if this hybrid saw is worth it. Another one by Shop Fox, this hybrid model has some significant features that make it different from a classic cabinet and contractor saw. This is one of the most popular hybrid saws on the market, and its durability and power may be the reasons why. We’re talking about a 2HP single-phase, 120V-240V motor that’s prewired to 120V. Its cabinet bottom is enclosed with 4inches dust port. Of course, its cast iron table is a crucial features, since it’s precision ground and it features steel wings. Also, the saw’s Rip capacity is 30 inches to right, and 15 inches to left. Also, you’ll feel like a professional woodworker thanks to this hybrid model’s design and capabilities. Finally, the lift-off fence features a front/rear locking ability, which makes work much safer. It’s hard to find a critical review of this hybrid tool, which says a lot about its quality. However, a very few people have experienced the lock handle breaking. Please, note that this can very well be the cause of misuse, so take the review with a grain of salt. However, if this happens to you even if you’ve used the hybrid tool accordingly, you should definitely contact Shop Fox. At last, they’re the best to replace the broken part or help you any other way. Ideal hybrid tool for professionals and anyone else who wants to do serious woodworking. It’s a very powerful and very durable table saw. Of course, we’re talking about a perfect combination of cabinet and contractor saws. Its motor is 2HP, single-phased and 115V-230V voltage. It’s easy to put together and place in your shop thanks to its tripod caster system. This hybrid machine is heavy, so expect it to be stable enough to support all kinds of woodworking. The difference between this saw from others reviewed is that this hybrid model has a complete base. More precisely, this means that all the dust is locked inside until you clean it. Also, the blade features a clear guide providing you with better overview of the blade. It seems that the most common issue is that some parts are hard to replace. If it happens that a part breaks, you may have some trouble in getting a new part to replace it. Honestly, the best is to contact the manufacturer and see what kind of help you can get. Naturally, if the tool is still under warranty, you have better chances in getting any parts replaced. As we mentioned, a hybrid table saw is a combination of a cabinet and a contractor saw. It’s a hybrid tool, featuring all the benefits of these two type of saws. These models can be light, though they can be very heavy as well. Also, they’re much quieter than both cabinet style and contractor style saws. You can get many things done with a hybrid tool such as this one. More precisely, you don’t only have to be a professional, since this type of saws is perfect for all woodworkers. Obviously, this is a very important factor to consider. How and where the dust goes is a crucial thing about a table saw. Of course, the last thing you want is dust flying everywhere. Flying dust produced in woodworking is dangerous if you breathe it in or if it gets in your eyes. For that reason, you should always looks for a hybrid model that produces less dust, or the one with a good dust collector. Some of the models we reviewed have a dust port, while some have a complete base where they lock in the dust. Either way, it’s only important that the dust isn’t released in the air. Even if the table saw doesn’t feature a dust port, make sure it produces less dust. At the end of the day, less dust produced is less dust that you could potentially breathe in or get into your eyes. Normally, you want to be safe when you’re working with any kind of sharp knives and saws. As we said, these table saws are mostly for professionals who already know their way around very well. However, accidents do happen, and you want to make sure you prevent them the best you can. Luckily, some hybrid models have certain safety guards that insure your safety. Most of the time, these parts can be hard to replace, but you still shouldn’t leave them out. Look for the table saws that have a quick-release system. Also, make sure your table saw has separate riving knives. These knives prevent kickback, which is very important. Finally, a table saw with a clear blade guide is a good choice. It makes it easy to see the blade while you’re still protecting your fingers. Don’t overlook this, it’s important for your safety. We’re talking about a v-belt and pulley system that helps transfer the power to the blade. Naturally, it’s normal to lose some power this way, but these kind of hybrid models can cut through any thick hardwood. Also, there’s less dust in the motor because these motors are mounted away from the blade. Of course, this means the motor will last longer. However, this isn’t all that safe because of the kickback force. Plus, make sure that this part doesn’t show any sign of wear or tear. Belt driven table saws produce more torque and power. Naturally, this makes them perfect for professionals. Finally, they require maintenance simply because breakage of the belt in the middle of work could be potentially very dangerous. This is an important feature, and we recommend you get only a hybrid table saw that has it. It’s mostly important because of your own safety. More precisely, a riving knife reduces any rick of kickback. Logically, kickback is what causes the most table saw injures. It’s only normal that you want to protect yourself and be safe, so make sure that the riving knife has the same curve as the blade. Obviously, it shouldn’t lose its position even when you lower, raise and rotate the blade. Conveniently, there are some models of hybrid table saws that feature a quick-release knife. Of course, this isn’t as crucial and important, but it would add to the convenience, ease of use, and overall experience. Mostly, these hybrid table saws feature about 15 Amp motors, which is powerful enough to run these operations. Since amperage is an important factor because it directly influences the power of your table saw, make sure you know of what you’re buying. Horsepower and amperage are equally as important, so don’t overlook them in no way. Most models run on standard power, but don’t rely on that as much. Make sure to double check if your table saw will be able to run on standard power output in residential buildings. Dado is a method for connecting two pieces of stock functionally. It’s isn’t hard to do and you can use it to build a cabinet or a bookshelf. Simply, it’s one piece of wood that fits perfectly into a groove that’s cut into another piece of the wood. Look for an 8-inch dado inserts since those are large just enough to cut dadoes. There are also a 10-inch dado inserts, but in our opinion, they’re unnecessary. The 8-inch dado inserts don’t put as much weight to the blade set. Also, these dado blade inserts cost less money than the 10-inch ones. Simply, it takes less steel to build the blade and chipper that’s smaller in diameter. Finally, when you’re buying stacked dado blade inserts, pay attention to the arbor size of your hybrid saw. The set has to match your saw. Most of the time people overlook this step even though it’s very important. Take your time to align the tabletop to the blade because it’s crucial for both safety and accuracy. There are these parts in your table top called the miter gauge slots, and the saw blade should be aligned with them. You’ll know your tabletop is aligned when these parts are aligned as well. Simply, all you have to do is measure that alignment. Once you do that, tighten the bolts and that’s all. At last, some hybrid table saws come already aligned, but don’t rely on that way too much. Instead, check it and align them yourself if you must. Luckily, there are a lot of videos and detailed tutorials on how to do this, so we assure you that you won’t have any problems with it. In general, the speed depends on various factors such as the power of the motor, blade type, as well as wood type. Naturally, if your table saw has direct drive motor, revolutions per minute are the same for the arbor and the blade. Of course, there aren’t only direct drive table saws, but we can also find the pulleys we’ve mentioned above. This is crucial if you want to know all about the linear tooth or rim speed of the blade. Check also our guide about best band saw. What Jobs Would A Hybrid Table Saw Suit? As we’ve mentioned, these table saws are a perfect combination of cabinet saws and contractor saws. They’re very similar to them when it comes to reliability, features and jobs they’re able to do. These tools can do almost all that a cabinet saw can do. Regardless of whether you’re only a hobbyist or a serious woodworker, you’ll be pleased with a hybrid table saw. 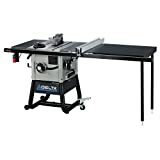 Naturally, you’ll be able to do any kind of commercial or residential work with a hybrid table saw. However, keep in mind that these saws aren’t quite as big as cabinets saws. Therefore, a cabinet saw can take on a larger project. If you need a table saw that gets the job done quickly, precisely, and easily, this is the one. Also, hybrid table saw is lighter and easier to transport and move around. What Makes Hybrid Table Saws Different From Other Table Saws? To mention it one more time, hybrid table saw is a combination of both a cabinet saw and a contractor saw. 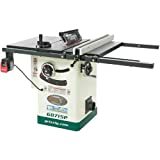 It features best of both worlds, getting the best features and benefits from each of these styles of table saws. However, it does have some crucial differences from the other two types. First and foremost, a hybrid table saw isn’t as expensive as a cabinet table saw. 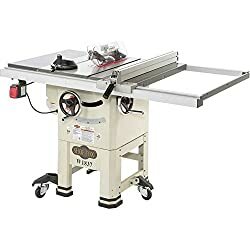 If you’re a hobbyist or a small contractor and you can’t afford a cabinet table saw, a hybrid table saw is just as good. On the other hand, this table saw has more features and bigger ability than the contractor-style saw. When you combine the two, you get the hybrid table saw that cost less money, is of good quality, and it’s functional and convenient. They’re smaller than cabinet saws, lightweight and feature smaller motors. More precisely, its motor is usually from about 1 ½ to 2 HP. There are hybrid table saws that feature a closed cabinet base, while some only feature a cabinet underneath. When it comes to the difference from a contractor saw, it’s important to say that the motor of a hybrid table saw is mounted inside the body. Also, this style of table saw features better design, belt style, etc. All of that results in fine cuts, less maintenance, impressive results, and convenience. To summarize, a hybrid table saw is a smart investment if you’re serious about woodworking. We hope that you found these reviews useful and helpful in making the decision of buying a hybrid table saw. Of course, there are a lot of models on the market and the search can get overwhelming, but that’s why we’re here. 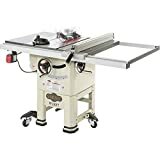 Make sure you look into these reviews in order to choose the best hybrid table saw for you. Naturally, reading a hybrid table saw review is always a good idea if you’re looking to learn more about the model and its features. Each of these hybrid table saws has its own unique features and specifications that make it stand out better than the rest. Finally, these are the best hybrid table saws that you can find on the market, so just look into which carries the features that you need. Have you ever used a hybrid table saw? What’s your opinion on cabinet and contractor table saws? Do you have any previous experience in woodworking? Please, make sure to join the discussion by leaving a comment in the section bellow.